(humerus) sits into. If this cartilage tears this is called a labral or SLAP tear. A SLAP tear refers to a Superior Labral tear from Anterior to Posterior. In a SLAP tear the top (superior) part of this cartilage ring becomes damaged. At this same point the tendon connecting the bicep muscle of the arm is anchored to the shoulder joint. A SLAP or labral tear may occur from an accident, or from repetitive straining of the shoulder. These types of injuries are commonly seen among athletes who do a lot of overhead throwing, such as cricket and softball, and among weightlifters. People may also experience a dull aching pain in the shoulder, and have difficulty sleeping due to shoulder discomfort. Athletes will often describe a sensation of having a ‘dead arm’. Type I SLAP lesions are common and often associated with the normal ageing process. Type II SLAP lesions involve a tearing and detachment of the long head of the biceps tendon. 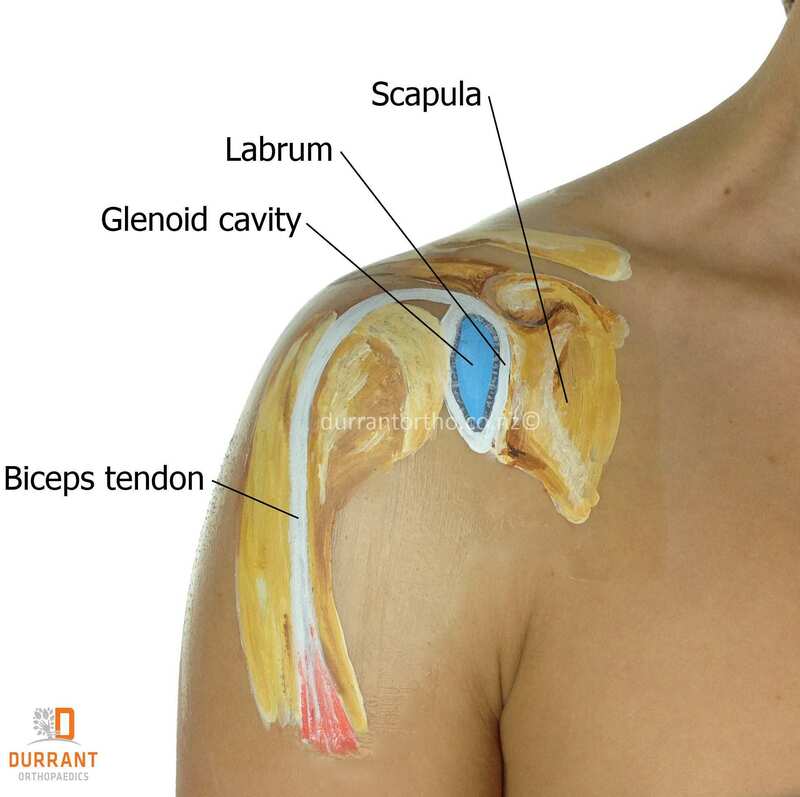 Type III SLAP lesions involves a “bucket handle” tear of the superior labrum without involvement of the biceps tendon. Type IV SLAP lesions involve both a tear of the labrum and detachment of the biceps tendon. Treatment of labral and SLAP tears generally require surgery. The majority of people with labral tears will not regain full shoulder strength unless it is repaired surgically. Non-surgical treatment will simply involve physical therapy to try to strengthen the shoulder and maintain full range of motion, as well as anti-inflammatory drugs. Most labral and SLAP repairs are carried out by arthroscopy. A small camera, as well as long narrow instruments, is inserted through small cuts into the shoulder. The small camera gives Mr. Durrant a clear view of the labral cartilage and the tear. The tear is repaired using sutures and it is then tied back into place using ‘anchors’ that are inserted into the bone. Please contact Mr. Adam Durrants office for more information on SLAP Tears or for additional resources on other shoulder related injuries.